The Killer Robots at Supercon! | The Killer Robots! The Killer Robots at Supercon! 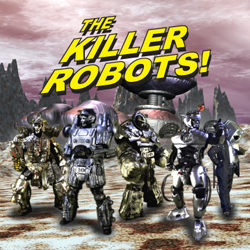 We are pleased to announce that our new movie The Killer Robots! Crash and Burn has been accepted to the Super Geek Film Festival at Florida Supercon in Miami, Florida! It will be playing Friday, July 1st at 11pm and Monday July 4th at 8:05pm. We will be set up during the whole con, so come by and say hi! And just a reminder, we will be performing at the Gods and Monsters Anniversary Celebration this Saturday, June 11th. We will be going on at 10:30 in full costume. Mutants, Space Worms/Blobs and Amazonian Ant Queens will also be in attendance. Oh and coffee and ninjas!